Termites begin life as eggs, laid by fertilized female termite who place the translucent, small and whitish eggs in a safe place such as an underground nest or a wall interior. All of the eggs in a clutch have the potential to develop into any of the termite colonies castes: soldier, reproductive or worker. As termite eggs near hatching they increase in size by 30 percent. Climate affects the time it takes for termite eggs to hatch, humid and warm conditions producing results fastest. Eggs laid in cooler climates need more incubation time. Depending on the climate, termite eggs hatch within 26 to 30 days. The larvae are the same size as the eggs which they hatched from. 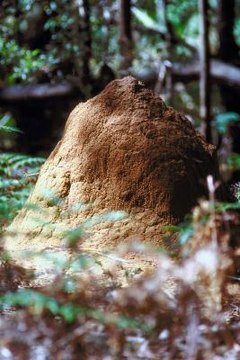 Worker termites immediately tend to the larvae by providing nest maintenance, food storage and foraging. As the larvae grow, they reach the nymph stage, which determines what caste the termite will become -- worker, soldier or reproductive -- according to the colony's needs. Molting is a growth process that termites experience several times throughout their lives. Molting occurs based on the needs of the colony. Soft exoskeleton skin develops underneath the hard outer layer exoskeleton. The termite reaches maturity and sheds the hard outermost exoskeleton. The exoskeleton naturally splits open and peels away from the termite. The underlying new exoskeleton hardens and enlarges. Depending on the evolving needs of the colony, termites can undergo regressive molts to change castes within the colony. Swarming termites leave the nest to create new termite colonies in different locations. This happens when the reproductive termites reach maturity and are capable of reproducing. They are then referred to as alates. They have functioning eyes and wings. Their bodies have a darker color and harder exoskeletons, allowing them to withstand less-humid air and more exposure to light as they swarm to the location of their new colony. The alates make their only flight to their new colony destination; this is known as the nuptial flight. Worker and soldier termites live up to two years. Their life spans are short compared with those of the reproductive termites, due to the fact that they burn energy more quickly thanks to their extremely high activity within the colony. Reproductives, such as the king and queen, live longer. A queen termite can live for decades in ideal conditions. The termite colony can persist beyond the life of the primary queen. Due to the queen having a long life span, the colony will have an extensive territory by the time the queen dies. Other colony queens keep reproduction moving forward with the secondary reproductive termites within the colony.